MOYNO PROGRESSIVE CAVITY PUMP, with 2.5 inch sanitary threaded inlet / outlet connections, on stainless steel base with a variable speed drive. guard; --portable, with casters on one end of the base, and legs on the other. 1HP 208/230/460volt 3 phase motor, coupled with a Reeves variable speed drive lever-adjustable from 81 to 580 RPM. Estimated capacity approximately 5 to 25 gallons per minute. 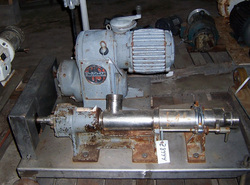 As of this writing, this Moyno pump is in stock at Alard in good condition, available for timely shipment. ...16 foot 6 inch long by 53 inch wide by 46 inch deep tapered bottom wash tank, with ELEVATING DISCHARGE CONVEYOR. Product travel in water is approximately 11 linear feet. 7 foot long by 48 inch wide perforated interlocking plastic chain type belt. Complete with 16 inch high stainless steel sides above the tank edges, (3) powered stainless steel immersion paddles spaced at three foot intervals, spray-rinse nozzles over discharge, powered cleaning brush under belt at discharge, and bottom cleanout drain. All food grade stainless steel construction. Overall dimensions including all drive mounts and protuberances as currently configured, are 20 feet 4 inches long, by 90 inches wide, by 90 inches high. Includes two fractional horsepower 3 phase drives, one for the belt and brush, the other for the paddles. 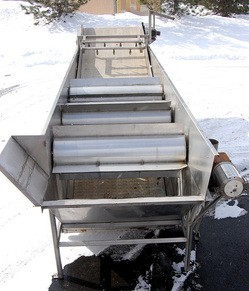 As of this writing, this industrial food process wash tank / dip tank / rinse tank is in stock at Alard, in good condition, available for timely shipment. 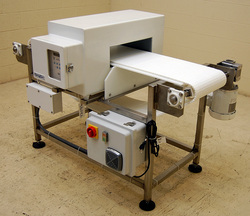 Refurbished GORING KERR Model DSP DIGITAL METAL DETECTOR with NEW STAINLESS STEEL CONVEYOR. 3 7/8 inch high by 16 inch wide usable aperture opening in epoxy-painted aluminum washdown-sealed search head enclosure. The reconditioned metal detection head is mounted on a NEW STAINLESS STEEL THROUGH-CONVEYOR, with a 12 inch wide by 60 inch long perforated plastic interlocking chain type belt over a UHMW plastic bed, on a tubular stainless steel frame. The conveyor runs in a left-to-right product flow (from the perspective of the operator control panel), at a 34" working height on height-adjustable foot pads. The conveyor is complete with BELT-STOP-ALARM reject system with a new PVC control box, and new washdown fractional horsepower single phase drive, 110 volt single phase electrical input. All components gasketed / sealed in a food grade sanitary washdown configuration. A REFURBISHED metal detector on an all NEW conveyor, in stock at Alard in EXCELLENT operational, electrical, mechanical, and cosmetic condition; ready to go and available for immediate shipment. AUTOMATIC PRESSURE SENSITIVE SPOT / WRAP-AROUND LABELER, CTM 360 Series, with THROUGH-CONVEYOR and HOT-STAMP CODER. 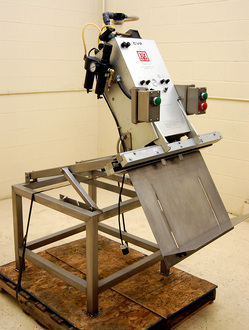 CTM Model 360 series label applicator, configured for merge (wipe-on) label application. 5 inch wide application head, manufacturer rated for placement to within 1/32 inch, minimum label size 3/4 inch square, maximum label size with 5 inch head 5 inch by 20 inch, up speeds up to at 1500 label inches per minute. Complete with microprocessor operator controls. 3.75 inch wide by 9 foot 10 inch long conveyor with interlocking plastic chain type belt, with indexing / timing worm for automatic operation. Right to left flow from operator / control position, with adjustable rails, variable speed operator control. 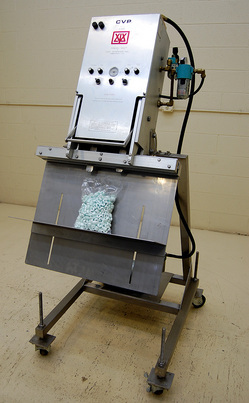 Complete with wrap station for wrap-around labeling on round containers, but can be also be used for spot labeling on round, or flat-sided containers. Conveyor and label head are height adjustable; presently set for 36 inch working height. Painted steel, aluminum, and stainless steel construction. Complete with Norwood MLP HOT STAMP CODER for printing lot numbers, production codes, sell-by dates or other information on the labels at the time of label application. As of this writing, this wrap / spot label application system is in stock at Alard, in good condition, available for timely shipment. LYCO 8 ROLL CONTINUOUS SCRUBBER / BRUSH-WASHER / ABRASIVE PEELER, all stainless steel. Currently fitted with 8 brush rolls, but can be configured with any combination of abrasive and / or brush rolls. 17 inch by 17 inch infeed chute to the peeling chamber, which has (8) 5 inch diameter by 80 inch long brush rolls, a full length metering screw for controlled retention time, and full length overhead spray bar to flush away peels and debris. The rolls are surrounded in stainless steel shrouding, with hinghed full length access doors on each side. Beneath the peelling chamber are stainless steel deflector panels to channel water and debris to dischage along the center line. All stainless steel body and frame set for 60 inch infeed height, 40 inch discharge height. Complete with central lubrication cluster. 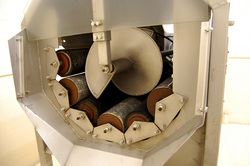 Belt drive system, with (2) 2HP variable speed roller drives (each drive powers four rolls), and a direct connected 3/4 HP variable speed auger drive. 208/230/460 volt 3 phase electrical inputs. 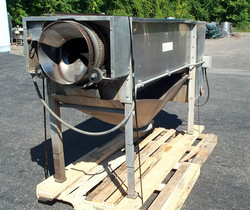 As of this writing, this peeling machine is in stock at Alard in very good condition, available for timely shipment. 6 ROLL ABRASIVE PEELER / BRUSH WASHER, all stainless steel, STARR Model 560, with hydraulic drive. 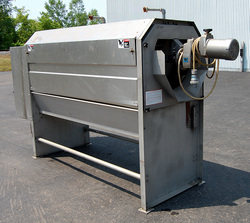 20.5 inch long by 16.5 inch wide tapered infeed hopper to peeling / scrubber chamber, currently set with (3) abrasive rolls and (3) brush rolls; but can be configured with any combination of abrasive and/or brush rolls for peeling, scrubbing, and washing applications. Above the rolls is a full length center spray bar with (7) spray nozzles, for flushing away dirt, peels and debris. A powered full length bar mobilizer, with discharge auger at the end both agitates product for even peeling, while controlling retention time. Beneath the rolls is a stainless steel water and debris catch pan with a 7 inch diameter center bottom outlet discharge. The peeling chamber is surrounded in stainless steel shrouding, with hinged side access doors. Tubular stainless steel frame construction, set for 66" infeed height, 33 inch discharge height, 20 inch drain pan discharge height. Complete with integral hydraulic power pack with stainless steel oil tank, and 7.5 HP 3 phase drive, with variable speed valving for rolls and mobilizer / discharge auger. As of this writing, this continuous abrasive peeling machine / brush washer / scrubber, is in stock at Alard, in good condition, available for timely service and shipment. VANMARK MODEL 26, 6-ROLL ABRASIVE PEELER / BRUSH WASHER / SCRUBBER, stainless steel, with hydraulic drive. Can be configured with any combination of abrasive and/or brush rolls for peeling, scrubbing, and washing applications. 12 inch wide by 27 inch long tapered infeed hopper to peeling roll chamber, with (6) 6 inch diameter by 72 inch long rolls. Above the rolls is a full length spray header to flush away dirt, peels, and debris. Retention time is controlled by a manually adjustable discharge gate. Beneath the peeling chamber a flared catch pan channels water and debris toward the center line. The peeling chamber is surrounded in stainless steel shrouding, with hinged side access doors. 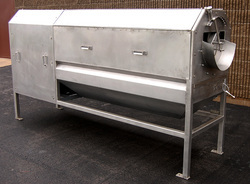 Tubular stainless steel frame construction, set for a 60 inch infeed height, and 38" discharge height. Complete with integral hydraulic power pack, with stainless steel oil tank, and 5HP 208/230/460 volt 3 phase drive, with variable speed valving for rolls. As of this writing, this continuous abrasive peeling machine / brush washer / scrubber is in stock at Alard, having been refurbished to EXCELLENT mechanical, hydraulic, and mechanical condition, needing only to be completed with brush and/or abrasive rolls. 13" wide by 17" long infeed chute at a 55" infeed height. Full length stainless steel spray bar in chamber to flush away dirt, grit, peels and debris. Powered sprial metering discharge screw auger at a 45" discharge height. Bottom drain water / waste catch pan / drain pan with center bottom outlet at 10" outlet height. Stainless steel shrouding and frame, with hinged side access doors to chamber. Chain and sprocket with 3 phase motor on variable speed mount. As of this writing, this 6 roll continuous peeling machine is in stock at Alard, available for timely service and shipment. Reconditioned 8 INCH FOOD PUMP with VORTEX IN-FEED TANK and 10HP DRIVE. Cornell Model 8NHPP-F18K cast iron hydro pump with patented expanded volute (for gentle product handling), with a 16.38 inch diameter impeller, and 8 inch diameter suction and discharge openings with flanged connectors. Manufacturer rated for pumping solids up to 5 inches in diameter by 9 inches long in water at up to 1,500 gallons per minute. Pump curves available on request. This water transfer food pump comes integrated with a 42 inch long by 41 inch wide by 25 inch deep feed tank on a tubular stainless steel frame, with a 44 inch infeed height, and a 10 HP 208/230/460 volt drive. As of this writing, this refubished 8 inch Cornell food pump with tank and motor is in stock at Alard in EXCELLENT operational, mechanical, and cosmetic condition, available for immediate shipment. 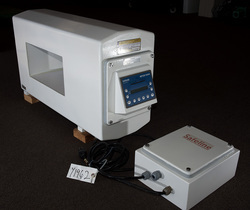 Reconditioned SAFELINE DIGITAL METAL DETECTOR with 7 inch high by 14 inch wide aperture opening in an epoxy painted aluminum search head enclosure. Serviced and test run for 1.5mm ferrous, 1.5mm non-ferrous, and 2mm stainless steel metal contamination detection (actual sensitivity in use will vary depending on product type, moisture content, etc). Complete with integral digital operator control panel with new keypad, battery,and seals, and a separate power supply box with cord. 110 volt single phase (stanard household current) electrical input. Horizontal aperture configuration for "push-through" or belt transfer applications; --head ONLY, no conveyor included (with sufficient lead time, we can fabricate one at extra cost). As of this writing, this refurbished Safeline metal detection head is in stock in EXCELLENT operational, electrical, mechanical and cosmetic condition, ready to go and available for immediate shipment. 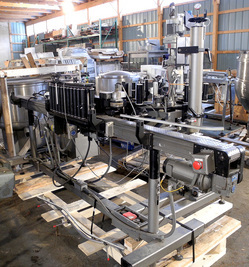 Reconditioned CVP VACUUM / GAS-FLUSH JAW TYPE BAG SEALER, Model A-300. 24" wide sealing bars with (2) 1.5"W vac/flush snorkels on 7" centers. Hand-lever sealing-jaw activation. Stainless steel tubular frame with pivot mount for adjustable sealing orientation, with slotted bag holder shelf adjustable for approximately 9" to 20" bag heights. Integrated operator controls for gas, vacuum, seal temperature, and cool time. Powerful 3/4 HP electric-powered vacuum pump. 110 volt single phase (standard household current) electrical input. As of this writing, this CVP Freshvac modified atmosphere bag sealer is in stock at Alard, refurbished to EXCELLENT operational, pneumatic, electrical, mechanical and cosmetic condition, available for immediate shipment. 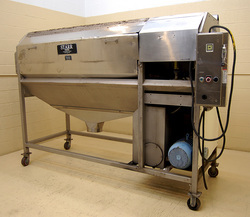 RECONDITIONED CVP Model A-300 "FRESHVAC" VACUUM GASSING BAG SEALER. 32" wide seal bar with twin snorkels. The sealer is mounted on a tubular stainless steel frame with swivel adjustment for horizontal, angled, or vertical orientation. Includes an on board venturi-principle PIAB vacuum pump, which uses compressed air to create vacuum. Complete with operator controls for sealing, vacuum, and gas flush. Pneumatically powered seal jaws are activated by a two-button safety-switch; includes controls for double-cycling. All sanitary stainless steel and aluminum construction, manufacturer rated and USDA listed for USDA sanitary inspection standards (e.g. for meat and poultry). As of this writing, this modified atmosphere bag sealing machine is in stock at Alard, reconditioned to EXCELLENT operational, mechanical, pneumatic and cosmetic condition, ready to go and available for immediate shipment.